The bestselling series meets a bestselling subject. The Photicular books, created through their patented technology, are not only magic to look at but magic to sell. With over two million copies in print and a robust backlist presence, the series ships over 300,000 copies a year. 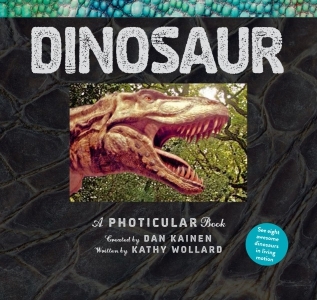 Next up comes a title that’s an instant wow: Dinosaur, a celebration of everyone’s favourite prehistoric beasts. We see their bones in museums. We pore over their imagined likenesses in books. We love movies that bring them to the big screen. Now, see dinosaurs come to life as if you were traveling on an expedition a hundred million years back in time. Using extremely lifelike animation, Dinosaur shows us a herd of giant sauroposeidons, with their impossibly long necks, lumbering across the sun-drenched plains eons and eons ago. Two angry triceratops preparing to lock horns. A threatened velociraptor standing tall, waving its wildly feathered arms. And, almost tenderly, a pair of duck-billed parasauropholuses feeling spring in the air and nuzzling. Flipping through these pages is as close as we’ll ever get to watching actual footage from earth’s distant past. The informative and lively text by science writer Kathy Wollard then brings us even closer through its insights and setting-the-scene storytelling. With T. rex roaring on the cover, Dinosaur is utterly irresistible. A brand-new book in the 2-million-copy Photicular series features images of dinosaurs.